Leading web design company, WalkerTek Interactive Marketing, http://www.walkertek.com, is proud to unveil its redesign of the Sarnoff Corporation website, based on extensive market research. WalkerTek’s online market research process, specifically designed for business-to-business companies, was the element Sarnoff needed. WalkerTek’s market research found out who was using the website, how they were using it, and most importantly, what tools and information they would like on the website. WalkerTek conducted both personal interviews with the web development team at Sarnoff as well as custom user surveys, which were distributed to Sarnoff employees, customers and vendors. The information collected from these surveys included both quantitative and qualitative information which allowed WalkerTek to make recommendations not only for the short-term redesign, but long-term ideas for future implementation. Once the market research was conducted, WalkerTek took the information and distilled it into a comprehensive report which could be easily interpreted by management. WalkerTek used this report as a guide for the redesign and implemented several elements on the website that address specific issues raised by participants in the research. “The research we conducted provided insight on the users of the Sarnoff website. Based on that research and our design process, we were able to design a site that will meet the long-term needs of the company,” said Michael Walker. The overall project took about two months and provided Sarnoff with a plan for future development, making the investment in the research even more valuable. 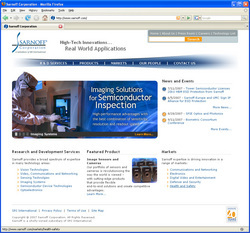 Sarnoff Corporation (http://www.sarnoff.com) produces innovations in electronic, video and vision technologies that generate successful new products and services for the government and commercial clients worldwide. Founded in 1942 as RCA Laboratories, Sarnoff makes continuous breakthroughs in ICs, lasers, imaging and sensing devices; digital TV and video for security, surveillance and entertainment; high-performance networking; and wireless communications. Sarnoff is a subsidiary of SRI International. WalkerTek is a web design company that provides professional interactive marketing services for a broad range of clients. Services include market research, web design, development, maintenance, and promotion. Search marketing services include both search engine optimization as well as search engine advertising programs. Our creative, technical, and marketing capabilities provide an excellent balance allowing us to create extremely effective online marketing campaigns. For more information, please visit http://www.walkertek.com.